The first Hyatt Place-branded hotel in the UK has opened six miles from London Heathrow airport. The 170-room Hyatt Place London Heathrow/Hayes is located six miles from Heathrow Airport and has links to the Heathrow Express, which travels to central London every 15 minutes. The hotel has 192sqm of meeting space spread over four high-tech function rooms, all of which have natural daylight. 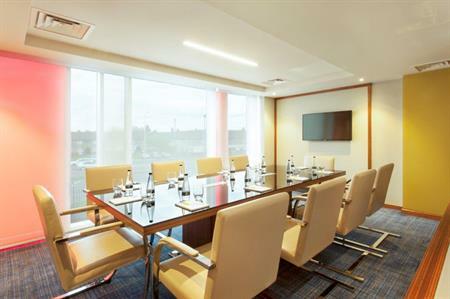 Its meeting packages include complimentary wi-fi and a dedicated event manager. Facilities at the hotel include two restaurants, one of which is open 24-hours, a coffee and cocktail bar, market and a 24-hour gym. "I am proud to welcome the first guests to Hyatt Place London Heathrow/Hayes, a hotel that truly reflects the needs of the modern traveler," said Sarru Swanni, general manager. "The hotel features the brand’s intuitive design, casual atmosphere and practical amenities, such as free wi-fi and 24-hour food offerings."